KAD’s Volume Control Dampers or Balancing Dampers are designed to balance air to individual areas. This unit comes with complete manual quadrant or motorized actuators. Volume Control Dampers can be manufactured with galvanized steel, stainless steel and aluminum. 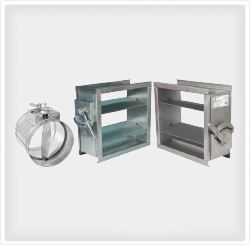 Dampers are suitable for the systems requiring air control. KAD Dampers are available from 100 mm to 1200 mm for single section, if the size is more than 1200 mm, the Damper will be manufactured in multi-section with single drive or multiple drives as per requirement. Pre-punched holes are available for easy installation.